Gary Sheffield is one of the most versatile and stimulating of military historians at work today, and this selection of his outstanding essays on the First World War is essential reading for anyone who is keen to broaden their understanding of the subject. For three decades, in a series of perceptive books and articles, he has examined the nature of this war from many angles – from the point of view of the politicians and the high command through to the junior officers and other ranks in the front line. Command and Morale presents in a single volume a range of his shorter work, and it shows his scholarship at its best. 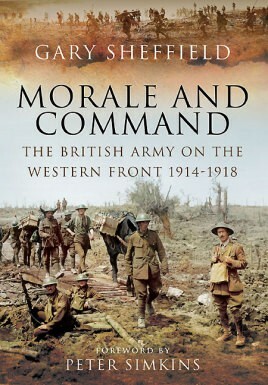 Among the topics he explores is the decision-making of the senior commanders, the demands of coalition warfare, the performance of Australian forces, the organization and the performance of the army in the field, the tactics involved, the exercise of command, the importance of morale, and the wider impact of the war on British society. Every topic is approached with the same academic rigour and attention to detail which are his hallmarks and which explain why his work has been so influential. The range of his writing, the insights he offers and the sometimes controversial conclusions he reaches mean this thought provoking book will be indispensable reading for all students of the First World War and of modern warfare in general.